Kids going stir crazy from being cooped up inside during the cold winter months? 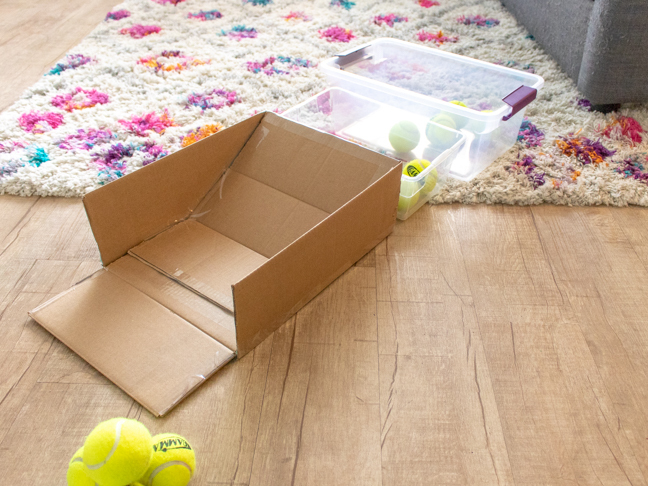 Since you don’t want kids running up and down your hallway to burn off energy, this fun DIY cardboard Skee Ball game is a great way to spend time as a family indoors without killing each other! 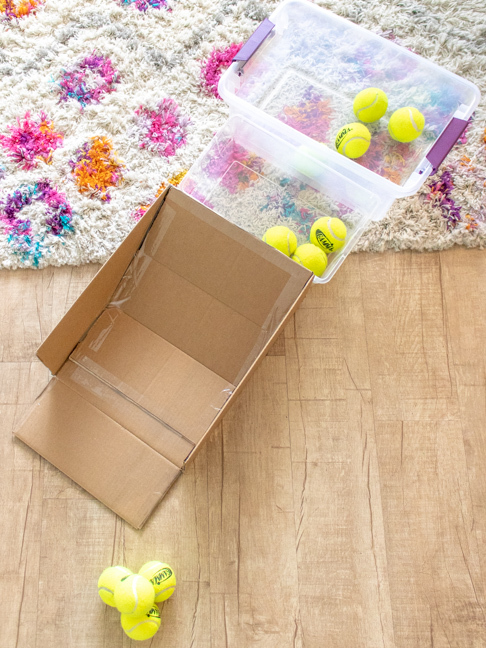 Upcycle any cardboard box into a ramp and use additional containers like plastic storage boxes or small laundry hampers to make this arcade-inspired game that will keep kids of all ages AND adults entertained. No, really, I played by myself for almost an hour because Skee Ball is my favorite arcade game! 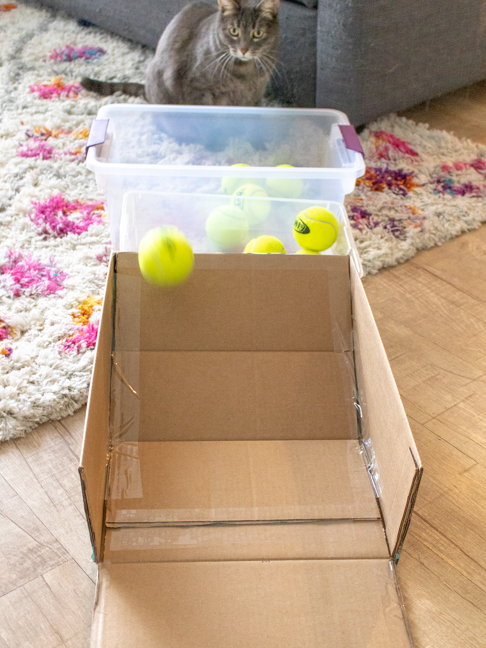 The best part is you can probably make this DIY Skee Ball game with supplies you already have in the house! 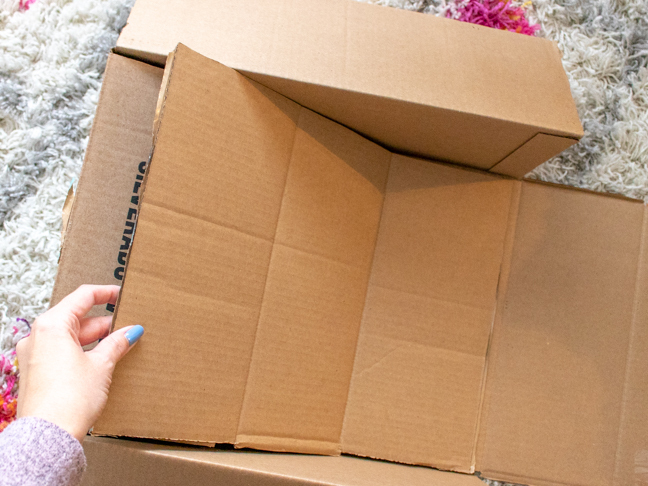 I hoard cardboard Amazon boxes so I have a lifetime supply at my fingertips! Depending on the space you’re in and how good your gang’s aim is, you may want to use lighter balls like ones you’d find in a ball pit rather than heavier tennis balls. You can buy them in bulk online. 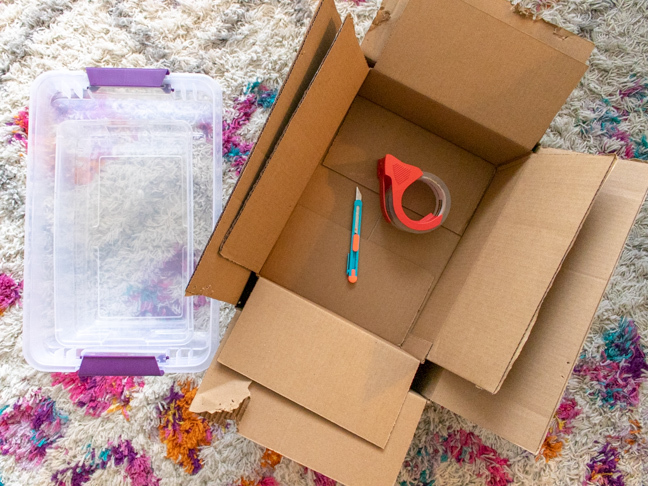 Step 1: Cut one short side of the box so that it lays down flat. Leave the rest intact. This flap will be the beginning of the ramp. 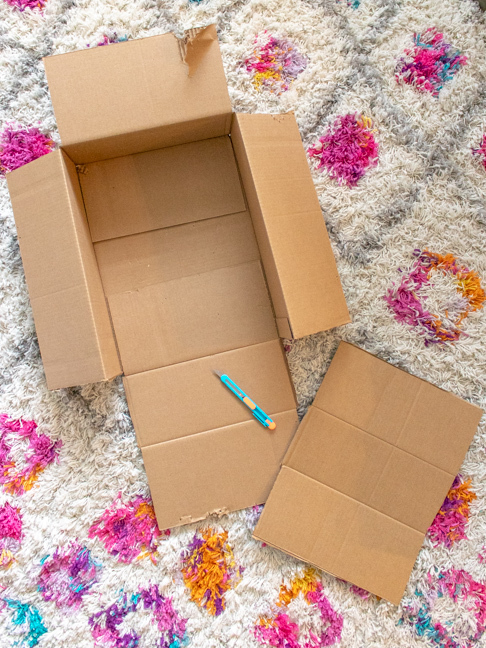 Step 2: From the second box, cut away a large piece approximately the length of the first box – it helps if it already has folds. Cut to match the width of the first box. Step 3: Fold in the flap that is opposite the ramp edge. Place the piece from the second box over it and tape the top. Then add tape to the sides and bottom, forming it into a ramp shape and using the folds as a guide. Step 4: Lastly, you can either cut away the flaps on the sides, or tape them down for extra stability. I taped them down to the sides. 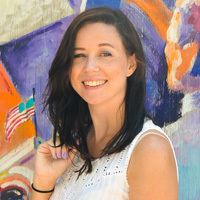 To Set Up: Then you can make it into a game! Place on a flat surface and put 2-3 containers behind the ramp (you can leave space or not depending on how difficult you want it to be). Simply roll a ball up the ramp to try to get it into the containers for points. The further away the container, the more points! Our cat loved chasing the balls that missed! When you’re not using the game, it stores away easily, and you can repurpose the other containers as storage. Get ready to play away for the rest of winter!